South Dakota, every bill gets a hearing unless withdrawn by the prime sponsor, and it seems like this year there are a lot of “talker” bills that eat up large amounts of committee time…meaning other bills get moved to the next scheduled day, or the next, or the next. 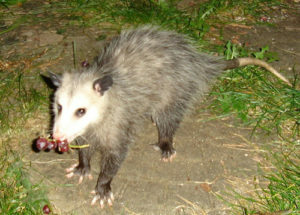 While we wholeheartedly support legislators taking their time to consider complex questions and issues, perhaps taking twenty minutes of a two-hour hearing hashing out whether a bill adding opossums to the predator list is deserving of an emergency clause is–pardon the pun–overkill. With dozens and dozens of bills yet to have hearings, it seems likely that many committees will be forced to reconvene post afternoon floor debate (which may also go long with “talkers”), and continue into evening hours. Pizza party, anyone? C-PACE Up Monday–Contact House C&E Members to Support! DRA’s Community Energy Development (CED) Committee has been working hard over the past year to update our Commercial Property Assessed Clean Energy (C-PACE) bill to address concerns of last year’s opponents, as well as to bring new allies and sponsors on board. This bill is “state-enabling” legislation, which means that it provides the opportunity to set up a “PACE authority” in our state, and for counties to get on board if they so choose. C-PACE is a program, already implemented in dozens of states, which is designed to provide long-term, low interest loans to commercial property owners in order to implement energy efficiency and renewable energy upgrades to their facilities. The loans are structured to be cash flow positive, meaning that the energy savings outweighs the cost of the loan payments. The loans stay with the property, and are paid back as part of a special assessment on the property. DRA sees this program as an excellent opportunity for our rural, as well as urban communities to upgrade existing infrastructure in order to lower the costs of doing business. It also provides opportunities for workforce development and investment in local businesses by our community banks. Click on the bill number to read the language of HB 1090. Contact House Commerce & Energy Committee to Vote YES on C-PACE! In what turned into an energetic “group hug” with a long line of proponents, HB 1191, which would legalize the growth, production, and processing of industrial hemp and derivative products in the state, passed the House Ag Committee with unanimous support. There was a small amendment to the original bill, acknowledging the fact that cannabidiol (CBD) is still a scheduled drug in South Dakota. The last time an industrial hemp bill passed the House Ag Committee was in 2017 on an 11-2 vote. In that session, Dakota Rural Action was the only organization to rise in support of the bill, and although there was a long line of opponents (including law enforcement and the Dept. of Ag), the committee agreed strongly with DRA’s position that industrial hemp is a good opportunity for our farmers. The bill went on to pass the House floor on a ⅔ vote, only to die on the last day for bills to be heard in Senate Ag Committee. With passage of the new Farm Bill, and the long list of sponsors on this year’s hemp bill, we feel strongly that, to quote hopeful sports team fans, “this could be the year” that industrial hemp goes the distance to the Governor’s desk. Contact Your House Reps to Vote NO! HB 1234 is a bill that would take a portion of the contractor’s excise tax paid on construction of new Concentrated Animal Feeding Operations (CAFOs) and give it to the school district in the county where the CAFO is built. We see this as a “lever” for the industry to pry their way into communities where they are unwanted–and, in fact, the prime sponsor admitted that with new CAFO construction levelling off, the purpose was to “help communities see the benefits” (because many are starting to say “no”), and overcome their concerns with an influx of cash. The problem with this scheme is that it’s a very uneven way to fund schools, and creates uncertainty in the funding stream. Another concern is that this “additional” funding (IF counties were to permit more CAFOs) would simply be offset by the state taking away other dollars, much like what has happened with wind turbine dollars. Because of these concerns, the Department of Revenue and the lobbyist for large school districts testified in opposition. However, the bill made it out of committee on an 8-5 vote, and moves to the House Floor. Contact Your Representatives to Vote NO on this Corporate Leverage Scheme! Earlier this winter, DRA staff participated in a round table discussion with allies in Standing Rock, Rosebud, and Oglala Sioux Tribes, as well as Clean Water Alliance, to discuss and draft legislation relating to Department of Environment & Natural Resources (DENR) water permits, Public Utilities Commission (PUC) certification of facility permits, as well as the authority of Tribal Historic Preservation Officers (THPOs) to intervene in projects that threaten to damage cultural or historical sites outside of current reservation boundaries. While none of these bills have been scheduled for a hearing, they will be coming up soon, and we encourage our members to watch for updates and Action Alerts in order to get involved. Due to the large number of bills yet to be scheduled for a hearing, we have decided to cancel our Citizen Lobby Days this Sunday & Monday, February 10th & 11th. A number of members expressed to us that they were hesitant to attend lobby days when the likelihood of “their” bills coming up within a day or two afterward is so high–necessitating a separate trip to the Capitol. Recognizing the special circumstances of this “logjam session,” staff determined that focusing our efforts on supporting groups of members working on specific legislation is a more strategic use of time and resources. We thank those who RSVP’d, and look forward to a less clogged-up session next year!